A new, larger 32-fl.-oz. bottle size of LambdaStar UltraCap 9.7 percent is now available. The larger size provides cost savings along with fast knockdown and extended residual protection. 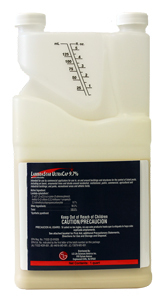 LambdaStar UltraCap 9.7 percent is a micro-encapsulated formulation with the potency of 9.7 percent lambda-cyhalothrin. It is labeled for use indoors, including food areas, and for use outdoors including structural, turf and ornamental as well as livestock housing sites. The label also features a CAUTION signal word. The product is also still available in the 16-fl.-oz. measure bottle.